NHBC were appointed as the Approved Inspector for this new food production, head office and training centre for the Maroush restaurant franchise. 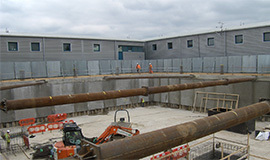 Construction of the building consisted of a four storey new buildwith a contiguous piled basement and reinforced concrete frame superstructure. The building is targeted to have a BREEAM rating of Excellent, with an envelope comprising a mixture of contemporary cladding and glazed curtain walling systems. 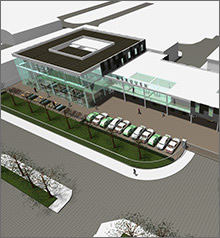 "The demolition of the former Park Royal Ambulance Station has led to an exciting opportunity of regenerating a site, in developing a highly energy efficient, modern development, that is an exemplar of high- quality design and contemporary architecture, aiming to contribute positively to the surrounding area of McNicol Drive and Park Royal. The strong collaboration of all members of the design team and the influential knowledge and advice provided by the NHBC throughout, has led to a successful outcome and unveiling design." NHBC was appointed early in the design process as part of the consultative team to ensure the right level of consideration was given to all aspects of the Building Regulations across all areas of the proposal. Particular attention was paid to the general fire strategy principles, specifically on issues around fire compartmentation due to boundary separation and complex natural basement venting arrangements. NHBC worked closely with the client to advise and agree a suitable solution to achieve Building Regulation compliance whilst achieving cost savings on fire times for levels of compartmentation and boundary separation times in certain areas of the building.